The Turkish, Russian and Iranian governments had agreed on talks in Astana in Kazakhstan between delegations from “moderate” militant groups in Syria and the Syrian government. Ahrar al Sham, which ideologically borders between al-Qaeda and the “moderates”, was also invited. It declined to take part in solidarity with the not invited designated terrorist group Jaish Fateh al-Sham (the former Nusra Front aka al-Qaeda in Syria).Russia had suggested the talks with the intent of separating the “moderate” Takfiris under Turkish control from the designated “terrorist” Takfiris. The talks had no immediate results but still achieved their purpose. Shortly after the talks began al-Qaeda attacked Ahrar al Sham. After some on and off fighting al-Qaeda started yesterday to attack all “moderate” Takfiri groups in Idleb and Aleppo governate. I was wrong. 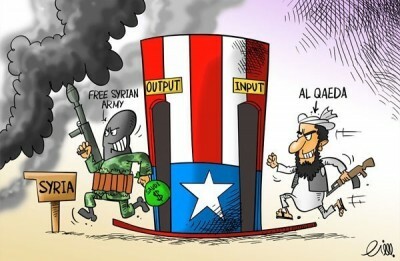 Ahrar did not fight with al-Qaeda, al-Qaeda did not attack it. As far as one can tell they coordinated their actions for the purpose of eliminating smaller “rebel” groups under the disguise of Takfiri infighting. Those smaller groups are led by local war lords and supported by Turkey and the CIA. They all had earlier cooperated with al-Qaeda which provided the “storm troopers” for their attacks on Syrian government forces. They recently took part in the Astana talks while Ahrar declined in solidarity with al-Qaeda. The ruse came to light when the “reports” of Ahrar and al-Qaeda infighting were not followed up with any reports of casualties, neither from the sides of those groups nor from any other account. How can there have been fighting when no one was killed or wounded? It seem that the plan for now is to keep Ahrar al-Sham as a “moderate” front group for al-Qaeda while eliminating all other “moderate” forces on the ground. Parts of Ahrar al-Sham take part in the Turkish “Euphrates Shield” operation against the Islamic State while al-Qaeda in Syria is no longer openly supported by the Turkish state. The ruse of the claimed fight between Ahrar and al-Qaeda is used to uphold a distinction between these groups even when hardly any exists. Ahrar al-Sham was, like al-Qaeda in Syria, founded by a senior member of al-Qaeda central under command of the al-Qaeda’s central leader Ayman al-Zawahiri. There once were components within Ahrar that argued for a less radical course. But other significant parts had argued for officially joining al-Qaeda. The middle ground found now is to cooperated with al-Qaeda as a means for absorbing all other “rebel” groups on the ground while keeping up good relations with Turkey. The Associated Press still reports fighting between Ahrar and Al-Qaeda based on quotes of the Gulf propagandist Charles Lister. Like us it fell for the ruse. Unlike us it will probably stick to the fake version. The ruse will thus have worked in deceiving the “western” public and decision makers.